Kinens, A.; Sejejs, M.; Kamlet, A. S.; Piotrowski, D. W.; Vedejs, E.; Suna, E. J. Org. Chem. 2017, 82, 869–886. 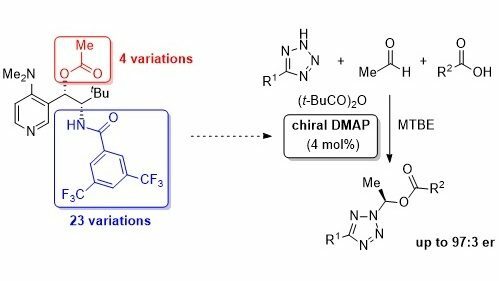 A new catalyst for the dynamic kinetic resolution of azole hemiaminals has been developed using late-stage structural modifications of the tert-leucinol-derived chiral subunit of DMAP species.